I thought about making a Spinner Card to fit MJ's sketch, but instead used the Faux Stitching and Cuttlebug Highlights techniques from past issues of the TJNL. 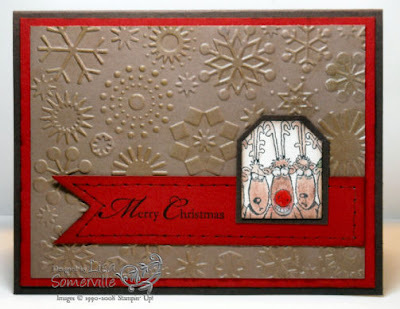 Instead of using ink to highlight my Cuttlebug embossing, I used my Shimmerz paints. My image is stamped on watercolor paper in Black Archival, then colored with my Shimmerz, for a nice festive look. I punched my image with the Small Tag Punch, sponged the edges with Chocolate Chip, then layered it on a piece of Chocolate Chip that was punched with the Large Tag Punch. The sentiment from A Cardinal Christmas is stamped in black, then I added my Faux Stitching (Tool Kit and Chocolate Chip Marker). If you're looking to purchase Shimmerz - I've gotten mine at The Rubber Cafe. Don't forget to stop by Pat's Blog to see what she created today for the TJ Blogstravganza, and to view the links of the other Design Team members. Here's MJ's original sketch - if you'd like to play along, simply leave your comment on this blog post, or if you upload to SCS please use keyword TSSC42. Wonderful card Lisa! I love the colors. Super job Lisa, love both techniques and of course those little reindeer are adorable. Great job on the challenge, thanks for playing along. Lovely card Lisa, I love the cuttlebug on it. Hee hee! this is so cute!! something about those reindeer make me giggle! Umm, that background looks like liquid chocolate; good enough to eat!! lol! 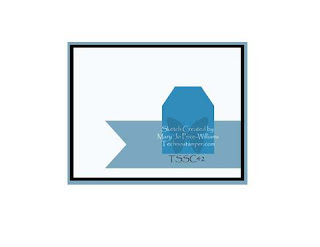 Love the way you used only part of the image on the tag..great idea, and great card as always!